With the signs of the zodiac shown according to the mystic arrangement of Jakob Boehme, the personifications of universal agencies. The four fixed signs of Taurus, Leo, Scorpio, Aquarius, are shown as the arms of great St. Andrews cross. Upon this cross the Solar Man is annually crucified, and by his death enters the grave of creation, that he may redeem the creatures dwelling within the shell of the world egg. The pagans looked upon the stars as living things, capable of influencing the destinies of individuals, nations, and races. That the early Jewish patriarchs believed that the celestial bodies participated in the affairs of men is evident to any student of Biblical literature, as, for example, in the Book of Judges: "They fought from heaven, even the stars in their courses fought against Sisera." The Chaldeans, Phœnicians, Egyptians, Persians, Hindus, and Chinese all had zodiacs that were much alike in general character, and different authorities have credited each of these nations with being the cradle of astrology and astronomy. The Central and North American Indians also had an understanding of the zodiac, but the patterns and numbers of the signs differed in many details from those of the Eastern Hemisphere. The word zodiac is derived from the Greek ζωδιακός (zodiakos), which means "a circle of animals," or, as some believe, "little animals." It is the name given by the old pagan astronomers to a band of fixed stars about sixteen degrees wide, apparently encircling the earth. Robert Hewitt Brown, 32°, states that the Greek word zodiakos comes from zo-on, meaning "an animal." He adds: "This latter word is compounded directly from the primitive Egyptian radicals, zo, life, and on, a being." The Greeks, and later other peoples influenced by their culture, divided the band of the zodiac into twelve sections, each being sixteen degrees in width and thirty degrees in length. These divisions were called the Houses of the Zodiac. The sun during its annual pilgrimage passed through each of these in turn, Imaginary creatures were traced in the Star groups bounded by these rectangles; and because most of them were animal--or part animal--in form, they later became known as the Constellations, or Signs, of the Zodiac. There is a popular theory concerning the origin of the zodiacal creatures to the effect that they were products of the imagination of shepherds, who, watching their flocks at night, occupied their minds by tracing the forms of animals and birds in the heavens. This theory is untenable, unless the "shepherds" be regarded as the shepherd priests of antiquity. It is unlikely that the zodiacal signs were derived from the star groups which they now represent. It is far more probable that the creatures assigned to the twelve houses are symbolic of the qualities and intensity of the sun's power while it occupies different parts of the zodiacal belt. Some authorities are of the opinion that the zodiac was originally divided into ten (instead of twelve) houses, or "solar mansions." In early times there were two separate standards--one solar and the other lunar--used for the measurement of the months, years, and seasons. The solar year was composed of ten months of thirty-six days each, and five days sacred to the gods. The lunar year consisted of thirteen months of twenty-eight days each, with one day left over. The solar zodiac at that time consisted often houses of thirty-six degrees each. The first six signs of the zodiac of twelve signs were regarded as benevolent, because the sun occupied them while traversing the Northern Hemisphere. The 6,000 years during which, according to the Persians, Ahura-Mazda ruled His universe in harmony and peace, were symbolic of these six signs. The second six were considered malevolent, because while the sun was traveling the Southern Hemisphere it was winter with the Greeks, Egyptians, and Persians. Therefore these six months symbolic of the 6,000 years of misery and suffering caused by the evil genius of the Persians, Ahriman, who sought to overthrow the power of Ahura-Mazda. CHART SHOWING THE RELATIONSHIP BETWEEN THE HUMAN BODY AND THE EXTERIOR UNIVERSE. The ornamental border contains groups of names of animal, mineral, and vegetable substances, Their relationship to corresponding parts of the human body is shown by the dotted lines. The words in capital letters on the dotted lines indicate to what corporeal member, organ, or disease, the herb or other substance is related. The favorable positions in relation to the time of year are shown by the signs of the zodiac, each house of which is divided by crosses into its three decans. This influence is further emphasized by the series of planetary signs placed on either side of the figure. The plane of the zodiac intersects the celestial equator at an angle of approximately 23° 28'. The two points of intersection (A and B) are called the equinoxes. 25,920 years. (Authorities disagree concerning these figures.) This retrograde motion is called the precession of the equinoxes. This means that in the course of about 25,920 years, which constitute one Great Solar or Platonic Year, each one of the twelve constellations occupies a position at the vernal equinox for nearly 2,160 years, then gives place to the previous sign. Albert Pike describes the reverence which the Persians felt for this sign and the method of astrological symbolism in vogue among them, thus: "In Zoroaster's cave of initiation, the Sun and Planets were represented, overhead, in gems and gold, as was also the Zodiac. The Sun appeared, emerging from the back of Taurus. " 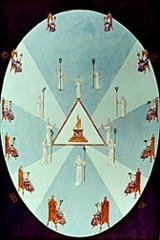 In the constellation of the Bull are also to be found the "Seven Sisters"--the sacred Pleiades--famous to Freemasonry as the Seven Stars at the upper end of the Sacred Ladder. In ancient Egypt it was during this period--when the vernal equinox was in the sign of Taurus--that the Bull, Apis, was sacred to the Sun God, who was worshiped through the animal equivalent of the celestial sign which he had impregnated with his presence at the time of its crossing into the Northern Hemisphere. This is the meaning of an ancient saying that the celestial Bull "broke the egg of the year with his horns." "But the slow progressive disappearance of the Bull is most happily commemorated in the vanishing series of letters so emphatically expressive of the great astronomical fact. For ABRACADABRA is The Bull, the only Bull. The ancient sentence split into its component parts stands thus: Ab'r-achad-ab'ra, i. e., Ab'r, the Bull; achad, the only, &c.--Achad is one of the names of the Sun, given him in consequence of his Shining ALONE,--he is the ONLY Star to be seen when he is seen--the remaining ab'ra, makes the whole to be, The Bull, the only Bull; while the repetition of the name omitting a letter, till all is gone, is the most simple, yet the most satisfactory method that could have been devised to preserve the memory of the fact; and the name of Sorapis, or Serapis, given to the Bull at the above ceremony puts it beyond all doubt. * * * This word (Abracadabra) disappears in eleven decreasing stages; as in the figure. And what is very remarkable, a body with three heads is folded up by a Serpent with eleven Coils, and placed by Sorapis: and the eleven Volves of the Serpent form a triangle similar to that formed by the ELEVEN diminishing lines of the abracadabra." "By attracting or heaving the waters of the ocean, she naturally appeared to be the sovereign of humidity; and by seeming to operate so powerfully upon the constitutions of women, she equally appeared to be the patroness and regulatress of nutrition and passive generation: whence she is said to have received her nymphs, or subordinate personifications, from the ocean; and is often represented by the symbol of the sea crab, an animal that has the property of spontaneously detaching from its own body any limb that has been hurt or mutilated, and reproducing another in its place." (The Symbolical Language of Ancient Art and Mythology.) This water sign, being symbolic of the maternal principle of Nature, and recognized by the pagans as the origin of all life, was a natural and consistent domicile of the moon. The autumnal equinox apparently occurs in the constellation of Libra (the Balances). The scales tipped and the solar globe began its pilgrimage toward the house of winter. The constellation of the Scales was placed in the zodiac to symbolize the power of choice, by means of which man may weigh one problem against another. Millions of years ago, when the human race was in the making, man was like the angels, who knew neither good nor evil. He fell into the state of the knowledge of good and evil when the gods gave him the seed for the mental nature. From man's mental reactions to his environments he distills the product of experience, which then aids him to regain his lost position plus an individualized intelligence. Paracelsus said: "The body comes from the elements, the soul from the stars, and the spirit from God. All that the intellect can conceive of comes from the stars [the spirits of the stars, rather than the material constellations]." The pagans believed that the zodiac formed the body of the Grand Man of the Universe. This body, which they called the Macrocosm (the Great World), was divided into twelve major parts, one of which was under the control of the celestial powers reposing in each of the zodiacal constellations. Believing that the entire universal system was epitomized in man's body, which they called the Microcosm (the Little World), they evolved that now familiar figure of "the cut-up man in the almanac" by allotting a sign of the zodiac to each of twelve major parts of the human body. in the Northern Hemisphere, and after passing through this constellation it immediately begins to increase. Hence the Greeks said that Jupiter (a name of the Sun God) was suckled by a goat. A new and different sidelight on zodiacal symbolism is supplied by John Cole, in A Treatise on the Circular Zodiac of Tentyra, in Egypt: "The symbol therefore of the Goat rising from the body of a fish [Capricorn], represents with the greatest propriety the mountainous buildings of Babylon rising out of its low and marshy situation; the two horns of the Goat being emblematical of the two towns, Nineveh and Babylon, the former built on the Tigris, the latter on the Euphrates; but both subjected to one sovereignty." From a consideration of this system, it is readily understood why certain religious symbols were adopted during different ages of the earth's history; for during the 2,160 years the sun was in the constellation of Taurus, it is said that the Solar Deity assumed the body of Apis, and the Bull became sacred to Osiris. (For details concerning the astrological ages as related to Biblical symbolism, see The Message of the Stars by Max and Augusta Foss Heindel.) During the Aryan Age the Lamb was held sacred and the priests were called shepherds. Sheep and goats were sacrificed upon the altars, and a scapegoat was appointed to bear the sins of Israel. During the Age of Pisces, the Fish was the symbol of divinity and the Sun God fed the multitude with two small fishes. The frontispiece of Inman's Ancient Faiths shows the goddess Isis with a fish on her head; and the Indian Savior God, Christna, in one of his incarnations was cast from the mouth of a fish. Not only is Jesus often referred to as the Fisher of Men, but as John P. Lundy writes: "The word Fish is an abbreviation of this whole title, Jesus Christ, Son of God, Savior, and Cross; or as St. Augustine expresses it, 'If you join together the initial letters of the five Greek words, Ἰησοῦς Χριστος Θεου Υιὸσ Σωτήρ, which mean Jesus Christ, Son of God, Savior, they will make ΙΧΘΥΣ, Fish, in which word Christ is mystically understood, because He was able to live in the abyss of this mortality as in the depth of waters, that is, without sin.'" (Monumental Christianity.) Many Christians observe Friday, which is sacred to the Virgin (Venus), upon which day they shall eat fish and not meat. The sign of the fish was one of the earliest symbols of Christianity; and when drawn upon the sand, it informed one Christian that another of the same faith was near. Aquarius is called the Sign of the Water Bearer, or the man with a jug of water on his shoulder mentioned in the New Testament. This is sometimes shown as an angelic figure, supposedly androgynous, either pouring water from an urn or carrying the vessel upon its shoulder. Among Oriental peoples, a water vessel alone is often used. Edward Upham, in his History and Doctrine of Budhism, describes Aquarius as being "in the shape of a pot and of a color between blue and yellow; this Sign is the single house of Saturn." When Herschel discovered the planet Uranus (sometimes called by the name of its discoverer), the second half of the sign of Aquarius was allotted to this added member of the planetary family. The water pouring from the urn of Aquarius under the name of "the waters of eternal life" appears many times in symbolism. So it is with all the signs. Thus the sun in its path controls whatever form of worship man offers to the Supreme Deity. There are two distinct systems of astrological philosophy. One of them, the Ptolemaic, is geocentric: the earth is considered the center of the solar system, around which the sun, moon, and planets revolve. Astronomically, the geocentric system is incorrect; but for thousands of years it has proved its accuracy when applied to the material nature of earthly things. A careful consideration of the writings of the great occultists and a study of their diagrams reveal the fact that many of them were acquainted with another method of arranging the heavenly bodies. The other system of astrological philosophy is called the heliocentric. This posits the sun in the center of the solar system, where it naturally belongs, with the planets and their moons revolving about it. The great difficulty, however, with the heliocentric system is that, being comparatively new, there has not been sufficient time to experiment successfully and catalogue the effects of its various aspects and relationships. Geocentric astrology, as its name implies, is confined to the earthy side of nature, while heliocentric astrology may be used to analyze the higher intellectual and spiritual faculties of man. The important point to be remembered is that when the sun was said to be in a certain sign of the zodiac, the ancients really meant that the sun occupied the opposite sign and cast its long ray into the house in which they enthroned it. Therefore, when it is said that the sun is in Taurus, it means (astronomically) that the sun is in the sign opposite to Taurus, which is Scorpio. This resulted in two distinct schools of philosophy: one geocentric and exoteric, the other heliocentric and esoteric. While the ignorant multitudes worshiped the house of the sun's reflection, which in the case described would be the Bull, the wise revered the house of the sun's actual dwelling, which would be the Scorpion, or the Serpent, the symbol of the concealed spiritual mystery. This sign has three different symbols. The most common is that of a Scorpion, who was called by the ancients the backbiter, being the symbol of deceit and perversion; the second (and less common) form of the sign is a Serpent, often used by the ancients to symbolize wisdom. Probably the rarest form of Scorpio is that of an Eagle. The arrangement of the stars of the constellation bears as much resemblance to a flying bird as to a scorpion. Scorpio, being the sign of occult initiation, the flying eagle--the king of birds--represents the highest and most spiritual type of Scorpio, in which it transcends the venomous insect of the earth. As Scorpio and Taurus are opposite each other in the zodiac, their symbolism is often closely intermingled. The Hon. E. M. Plunket, in Ancient Calendars and Constellations, says: "The Scorpion (the constellation Scorpio of the Zodiac opposed to Taurus) joins with Mithras in his attack upon the Bull, and always the genii of the spring and autumn equinoxes are present in joyous and mournful attitudes." The Egyptians, the Assyrians, and the Babylonians, who knew the sun as a Bull, called the zodiac a series of furrows, through which the great celestial Ox dragged the plow of the sun. Hence the populace offered up sacrifice and led through the streets magnificent steers, bedecked with flowers and surrounded with priests, dancing girls of the temple, and musicians. The philosophic elect did not participate in these idolatrous ceremonials, but advocated them as most suitable for the types of mind composing the mass of the population. These few possessed a far deeper understanding, as the Serpent of Scorpio upon their foreheads--the Uræus--bore witness. THE CIRCULAR ZODIAC OF TENTYRA. From Cole's Treatise--the Circular Zodiac of Tentyra, in Egypt. The oldest circular zodiac known is the one found at Tentyra, in Egypt, and now in the possession of the French government. Mr. John Cole describes this remarkable zodiac as follows: "The diameter of the medallion in which the constellations are sculptured, is four feet nine inches, French measure. It is surrounded by another circle of much larger circumference, containing hieroglyphic characters; this second circle is enclosed in a square, whose sides are seven feet nine inches long. * * * The asterisms, constituting the Zodiacal constellations mixed with others, are represented in a spiral. The extremities of this spiral, after one revolution, are Leo and Cancer. Leo is no doubt at the head. It appears to be trampling on a serpent, and its tail to be held by a woman. Immediately after the Lion comes the Virgin holding an ear of corn, Further on, we perceive two scales of a balance, above which, in a medal lion, is the figure of Harpocrates. Then follows the Scorpion and Sagittarius, to whom the Egyptians gave wings, and two faces. After Sagittarius are successively placed, Capricornus, Aquarius, Pisces, the Ram, the Bull, and the Twins. This Zodiacal procession is, as we have already observed, terminated by Cancer, the Crab." The occultists of the ancient world had a most remarkable understanding of the principle of evolution. They recognized all life as being in various stages of becoming. They believed that grains of sand were in the process of becoming human in consciousness but not necessarily in form; that human creatures were in the process of becoming planets; that planets were in the process of becoming solar systems; and that solar systems were in the process of becoming cosmic chains; and so on ad infinitum. One of the stages between the solar system and the cosmic chain was called the zodiac; therefore they taught that at a certain time a solar system breaks up into a zodiac. The house of the zodiac become the thrones for twelve Celestial Hierarchies, or as certain of the ancients state, ten Divine Orders. Pythagoras taught that 10, or the unit of the decimal system, was the most perfect of all numbers, and he symbolized the number ten by the lesser tetractys, an arrangement of ten dots in the form of an upright triangle. The early star gazers, after dividing the zodiac into its houses, appointed the three brightest scars in each constellation to be the joint rulers of that house. Then they divided the house into three sections of ten degrees each, which they called decans. These, in turn, were divided in half, resulting in the breaking up of the zodiac into seventy-two duodecans of five degrees each. Over each of these duodecans the Hebrews placed a celestial intelligence, or angel, and from this system, has resulted the Qabbalistic arrangement of the seventy-two sacred names, which correspond to the seventy-two flowers, knops, and almonds upon the seven-branched Candlestick of the Tabernacle, and the seventy-two men who were chosen from the Twelve Tribes to represent Israel. The only two signs not already mentioned are Gemini and Sagittarius. The constellation of Gemini is generally represented as two small children, who, according to the ancients, were born out of eggs, possibly the ones that the Bull broke with his horns. The stories concerning Castor and Pollux, and Romulus and Remus, may be the result of amplifying the myths of these celestial Twins. The symbols of Gemini have passed through many modifications. The one used by the Arabians was the peacock. Two of the important stars in the constellation of Gemini still bear the names of Castor and Pollux. The sign of Gemini is supposed to have been the patron of phallic worship, and the two obelisks, or pillars, in front of temples and churches convey the same symbolism as the Twins. The sign of Sagittarius consists of what the ancient Greeks called a centaur--a composite creature, the lower half of whose body was in the form of a horse, while the upper half was human. The centaur is generally shown with a bow and arrow in his hands, aiming a shaft far off into the stars. Hence Sagittarius stands for two distinct principles: first, it represents the spiritual evolution of man, for the human form is rising from the body of the beast; secondly, it is the symbol of aspiration and ambition, for as the centaur aims his arrow at the stars, so every human creature aims at a higher mark than he can reach. The Pythagoreans were often undeservedly criticized for promulgating the so-called doctrine of metempsychosis, or the transmigration of souls. This concept as circulated among the uninitiated was merely a blind, however, to conceal a sacred truth. Greek mystics believed that the spiritual nature of man descended into material existence from the Milky Way--the seed ground of souls--through one of the twelve gates of the great zodiacal band. The spiritual nature was therefore said to incarnate in the form of the symbolic creature created by Magian star gazers to represent the various zodiacal constellations. If the spirit incarnated through the sign of Aries, it was said to be born in the body of a ram; if in Taurus, in the body of the celestial bull. All human beings were thus symbolized by twelve mysterious creatures through the natures of which they were able to incarnate into the material world. The theory of transmigration was not applicable to the visible material body of man, but rather to the invisible immaterial spirit wandering along the pathway of the stars and sequentially assuming in the course of evolution the forms of the sacred zodiacal animals. In the Third Book of the Mathesis of Julius Firmicus Maternus appears the following extract concerning the positions of the heavenly bodies at the time of the establishment of the inferior universe: "According to Æsculapius, therefore, and Anubius, to whom especially the divinity Mercury committed the secrets of the astrological science, the geniture of the world is as follows: They constituted the Sun in the 15th part of Leo, the Moon in the 15th part of Cancer, Saturn in the 15th part of Capricorn, Jupiter in the 15th part of Sagittary, Mars in the 15th part of Scorpio, Venus in the 15th part of Libra, Mercury in the 15th part of Virgo, and the Horoscope in the 15th part of Cancer. Conformably to this geniture, therefore, to these conditions of the stars, and the testimonies which they adduce in confirmation of this geniture, they are of opinion that the destinies of men, also, are disposed in accordance with the above arrangement, as maybe learnt from that book of Æsculapius which is called Μυριογενεσις, (i.e. Ten Thousand, or an innumerable multitude of Genitures) in order that nothing in the several genitures of men may be found to be discordant with the above-mentioned geniture of the world." The seven ages of man are under the control of the planets in the following order: infancy, the moon; childhood, Mercury; adolescence, Venus; maturity, the sun; middle age, Mars; advanced age, Jupiter; and decrepitude and dissolution, Saturn. HIEROGLYPHIC PLAN, By HERMES, OF THE ANCIENT ZODIAC. The inner circle contains the hieroglyph of Hemphta, the triform and pantamorphic deity. In the six concentric bands surrounding the inner circle are (from within outward): (1) the numbers of the zodiacal houses in figures and also in words; (2) the modern names of the houses. (3) the Greek or the Egyptian names of the Egyptian deities assigned to the houses; (4) the complete figures of these deities; (5) the ancient or the modem zodiacal signs, sometimes both; (6) the number of decans or subdivisions of the houses.